Gearing up for the onslaught of possible disasters and calamities this 2016, Cebuana Lhuillier Microinsurance has pledged to bolster disaster resilience in the Philippines and promote disaster preparedness among Filipinos during the 2016 Ready: Disaster Resilience Forum – The Role of Microinsurance in Building Disaster-Resilient Communities held on January 27, 2016 at Makati Shangri-La Hotel. Stressing the importance of personal readiness and security to alleviate massive losses and damages during disasters, Cebuana Lhuillier President and CEO Jean Henri Lhuillier urged attendees to understand their possible roles in disaster management. “Calamities and disasters impact everyone, especially the poor and most vulnerable communities. Everyone has a role to play in building Filipino communities’ resilience against disasters and calamities, and Cebuana Lhuillier Microinsurance believes everyone must be empowered to prepare themselves against these kinds of crises, thus, we decided to embark on this mission for our country and for our people,” he said. Known for advocating education and sports development for the youth, Cebuana Lhuillier has long been helping Filipinos uplift their lives through its microfinancial solutions services and various CSR programs. “This time, we would like to instigate a whole new advocacy that would benefit a larger number of Filipinos. Today, we are giving our full commitment to contribute to our country’s disaster resilience through the microinsurance products and services we offer in Cebuana Lhuillier and by actively promoting it for public awareness,” he added. During the forum, Lhuillier also encouraged multi-stakeholder partnerships and collaborations among organizations that share the same objective of building disaster-resilient communities. “We recognize the importance of having a collaborative effort and support from relevant institutions to achieve the most impactful end result. Through this forum, we hope to open more doors for possible partnerships and encourage more organizations to join our mission—hand-in-hand,” he said. 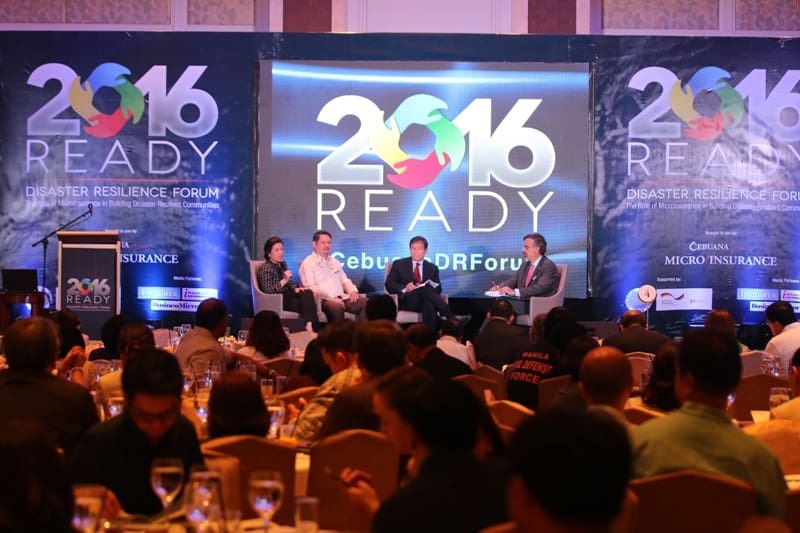 Presented in three parts—Ready to Initiate, Ready to Collaborate, and Ready to Innovate—the disaster resilience forum is spearheaded by Cebuana Lhuillier in an attempt to emphasize the importance of preparedness and provide means on how Filipinos can rebuild their lives after such events. Keynote speaker of the forum was Insurance Commission Hon. Emmanuel F. Dooc, while the other speakers were National Disaster Risk Reduction and Management Council Civil Defense Administrator and Executive Director Undersecretary Alexander P. Pama; Department of Social Welfare and Development Disaster Response and Assistance Management Asst. Bureau Director Felino O. Castro V; Philippine Disaster Resilience Foundation President Rene “Butch” Meily; ABS-CBN Lingkod Kapamilya Foundation Managing Director Susan Bautista-Afan; ASEAN Insurance Council Chairman Michael F. Rellosa; Project NOAH Executive Director Dr. Alfredo Mahar Francisco A. Lagmay; and Habitat for Humanity Philippines Western Visayas Regional Head Retired Major General Carlos B. Holganza. Citing true stories of Typhoon Yolanda survivors who were able to bounce back after the disaster, the forum also highlighted the role of microinsurance as a key tool in disaster preparedness. “We believe that microinsurance is one of the best existing tools to mitigate the impact of natural disasters. In the aftermath of Typhoon Yolanda, the microinsurance sector settled some P500 million claims involving more than a hundred thousand claimants,” Lhuillier said. “We believe on the possible assistance that microinsurance can offer to policy holders post disasters. That is why, we have been continuing our efforts in reaching more communities, especially those in the far-flung areas and those that are most vulnerable to disasters, to educate them with the benefits of microinsurance and encourage them to be covered,” he added. Through Cebuana Lhuillier Insurance Solutions (CLIS), the insurance arm of Cebuana Lhuillier, the company has been taking trailblazing initiatives to foster microinsurance especially now that CLIS has obtained ISO Certification. With the support of its insurers, CLIS has already covered more than 5 million Filipinos and settled P140 million claims. “So far, we have already deployed Microinsurance-on-wheels in different parts of the Philippines; developed the first microinsurance-dedicated app for Android phones called MicroPinoy; forged important partnerships with various organizations to push for microinsurance even more; we have been creating innovative and tailor-fit microinsurance products for the specific needs of our countrymen—all these efforts directed towards increasing the number of microinsurance coverage among Filipinos that will ultimately help them prepare against disasters,” Lhuillier said. Co-organized by the Insurance Commission (IC) and the GIZ (Deutsche Gesellschaft für Internationale Zusammenarbeit) Regulatory Framework Promotion of Pro-Poor Insurance Markets in Asia (GIZ-RFPI Asia), the forum coincides with the observance of January as Microinsurance Month.